Should we call it “the market of the beast”? When all was said and done Friday afternoon, the Dow Jones industrials had dropped 666 points. We hope you didn’t react by selling everything on the open today. 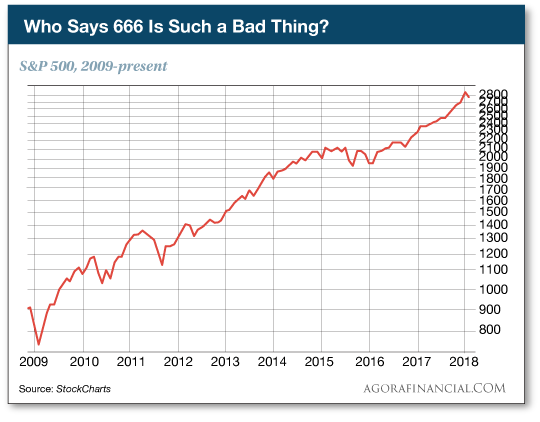 After all, the S&P 500 bottomed at the 666 level on March 9, 2009. Even after last week’s drop, the S&P has more than quadrupled in the last nine years. By the way, the 666-point drop doesn’t even crack the top five of bad days for the Dow, as measured by the number of points lost. It was shaping up to be another ugly day today before the open — Dow futures down 300 points. But as we write, the drop is a mere 80 or so, to 25,440. Heck, the Nasdaq is slightly in the green. At least now we can put all the chatter about “It’s been X number of days since a 3% pullback” behind us. The last time anything like that happened was shortly before Election Day 2016. Maybe, if you look closely, you can spot it on that chart. The next target, if you want to think of it that way, is a 5% pullback — which happened in June 2016, right after the “Brexit” referendum in Great Britain. That would drag down the Dow to 25,270 — another 170 points below this morning’s levels. Beyond that is a “correction” of 10% or greater. That last happened in late 2015-early 2016 as the market freaked out about the Chinese carrying out a “stealth” devaluation of the yuan. That would knock down the Dow below 24,000. For perspective, the Dow broke above the 24,000 level for the first time on Nov. 30 — barely two months ago. “Corrections are good,” says Agora Financial “quant” Jonas Elmerraji, who launched a proprietary trading platform to much success last year. “Corrections help shake out the weak hands when making money in the stock market starts getting too ‘easy.’ They’re absolutely required for a rally to stay intact. “So the selling we’re seeing here isn’t unexpected. Instead, the ‘risk-off’ trading we’re seeing is 100% human nature. “The whole time this stock market’s been ripping higher, we’ve all been told that the crash is coming right around the corner. Top calling has been front and center on everyone’s minds everywhere from CNBC to The Wall Street Journal. The sell-off notwithstanding, “the outlook for corporate earnings — and the American economy at large — has scarcely looked better,” says Alan Knuckman from his post in the Chicago options trading pits. And the economy? The big economic number this morning is the ISM nonmanufacturing Index — a measure of the service economy. It rings in at 59.9 — one of the best readings in the index’s 20-year history, and way higher than the “expert consensus” was counting on. For perspective, The 5’s voluminous archives reveal that 10 years ago today, this number registered an epic one-month collapse — from 54 to 41. Any number below 50 indicates a service sector that’s shrinking, not growing. And 10 years ago today, we were two months into the “Great Recession” of 2007–09. As we continue to write, the Dow’s losses have begun to accelerate and the Nasdaq is now in the red. At 25,333 the Dow is less than 70 points away from 5% pullback territory. Treasury yields continue to inch upward, the 10-year now 2.86 — another four-year high. Gold is holding steady at $1,333 — which is impressive because the dollar is showing a bit of strength again today. Crude has tumbled below $65 for the moment. It’s another rough day for cryptocurrencies. Nearly all of the top 50 cryptos are down double digits, with bitcoin at $7,409. We’ll dive into some of the whys and wherefores tomorrow. The likelihood of a new trade war just jumped significantly. And we don’t mean the U.S. versus China, but rather the U.S. versus Europe. Six months ago, we told you about new economic sanctions the United States was imposing on Russia. The sanctions crack down hard on companies involved in financing Nord Stream 2 — an offshore natural gas pipeline that would carry Russian gas to Germany. Germany needs lots of gas — to stay warm in the winter and especially to wean its power grid off the nuclear power plants that are scheduled to be shut down by 2022. If the Germans can’t get Russian gas, they have to get liquefied natural gas shipped on tankers — at immense cost — from the United States. The leading LNG player, Cheniere Energy (LNG), spent nearly $4 million on lobbying in 2016. Clearly its efforts paid off. Except that now the Germans have decided, “Screw it,” and granted a permit for construction of Nord Stream 2 anyway. True, other countries still have to sign off as well — Finland, Sweden and Denmark — but Germany is the big kahuna in the European economy. “Nord Stream 2 said it has fulfilled all requirements and expects permits to be issued by other countries in time for construction to begin as scheduled in 2018,” reports the Reuters newswire. Helping kick-start the process — supply hiccups in Great Britain and Norway, and a pipeline explosion in Austria. “It just reminded people that Europe is still vulnerable when it comes to energy,” Moscow-based analyst Chris Weafer tells the New Europe newspaper. Even if Washington doesn’t take any countermeasures, it’s clear the Europeans aren’t snapping to Washington’s tune anymore. This is what an empire in decline looks like. In the wake of France’s Nutella riots last month, the French government is — surprise, surprise — looking to impose new regulations. As you might recall, one of the country’s grocery chains offered a 70% discount on the chocolate-hazelnut spread — setting off scenes reminiscent of Black Friday sales in the United States a few years ago. Speaking of a lack of common sense, the French government has proposed a “law for a balanced commercial relationship in the agricultural and food sector, and for healthy and sustainable food” — which, stripped of the lofty language, amounts to a prohibition on selling goods at a loss. Discounts of more than 34%? Banned. Buy-one-get-one-free deals too. To the mailbag, where the chatter in Washington about raising the gasoline tax — one way to pay for a $1.5 trillion infrastructure plan — has readers up in arms. The 5: We keep hearing about some combination of federal, state and private-sector funds to make it all happen. But most state governments are strapped for cash, and those that aren’t still need to set money aside for their stupendous pension obligations. Meanwhile, anytime we hear talk of “public-private partnerships,” your editor’s hand defensively reaches for the wallet. Usually that’s code for a scheme to extract even more money from the productive classes and channel it toward favored cronies. “Obviously, the advocates of a higher gas tax are ignoring electric transportation expansion if he wants to raise gas taxes. The 5: For God’s sake don’t give them any more ideas about how to amp up the surveillance society any more than it is already! Oh, and starting in 2020, California will tack on a $100 surcharge to the annual vehicle registration fee for zero-emission cars. “Does Rep. Shuster actually believe that Congress can ‘fool all the people all the time’?” a reader asks of a Pennsylvania congressman who wants to raise the gas tax. Counters the reader: “The U.S. government set up and mandated the funding at the people’s ‘paycheck’ of the Social Security Trust Fund, which became the poster child for funneling money through a public trust to the coffers of the government for whatever purposes on which the spendthrifts in Congress choose to spend it. Worse, about 40% of “highway” trust fund revenues are diverted to mass transit, bicycle paths and other transportation projects unrelated to highways. “Sorry to say that I have grown very tired of all the so-called videos (most of which are actually audios) that drag on forever eventually getting to the point,” a reader writes about many of our sales messages. “You are not the only guilty party, however. This seems to be a very popular format used by many to try to sell you a product or service. “A word to the wise. Myself and many other professionals lose interest after about two minutes and simply click away. We don’t have time as professionals to sit in front of the computer for what seems like forever to get the information for whatever it is you’re selling. Keep it short and to the point and you will have a much better return. The 5: The complaints about “boring, long-winded videos” are a recurrent theme as we acquire new readers. So recurrent, we can almost set a watch by it. We test “long copy” versus “short copy” every so often. Almost always, the long copy wins. P.S. Whelp, now the Dow is down nearly 400 points on the day. At 25,149 we’re now solidly into 5% correction territory. On the way to 10%? Maybe, but you can spot two 11% corrections in a six-month span during late 2015 and early 2016. It was not the end of the world. P.P.S. Yikes, the selling has accelerated big-time. As we’re about to hit the send button, the Dow is down 1,500 points on the day. That 24,000 correction level? We’re there now… in only six trading days.